AIDA is a low-budget international effort that would send two small craft to intercept a double target. While one probe smashes into the smaller asteroid at around 6.25 km/s, the other records what happens. One effect would be a change in the orbital ballet of the two objects. AIDA is not intended to show how we could deflect an asteroid that threatens Earth but it would be a first step. The SpaceX Dragon launched yesterday will be visible in the southern hemisphere tonight as it moves towards the ISS: SpaceX’s Dragon Space Capsule Visible in Southern Night Sky – Space.com. 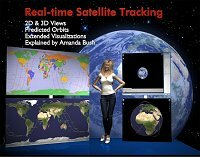 Find more about tracking spacecraft in the HobbySpace Satellite Observing section. This week, Bob came on the show on Tuesday, Thursday, and tonight Friday. 1. Falcon 9 static fire test a success. Launch on Friday. 2. Antares hot fire test a success. Antares launch in about 6 weeks. 3. India launched 7 satellites on one rocket on Monday. 4. The House passes bill renaming Dryden Center after Neil Armstrong. 1. A comet might hit Mars in October 2014. 2. Captain Kirk names one of Pluto’s moons! 3. New orbital data has revised the risks of Apophis hitting the Earth. 4. Mammoth Cave now longer than 400 miles. 1. China has scheduled its next manned mission for this summer. 2. The investigation into the recent Sea Launch failure finds problem but also reveals friction between Russia and Ukraine. 3. Update on Falcon 9 launch and sequestration. 1. Dennis Tito’s proposal to send a married couple in a fly-by of Mars. 2. Cave exploration, on Mars, on the Moon, and on Earth. Update: On tonight’s show, he will also discuss the SpaceX Dragon problems in orbit after its launch today. Update Mar.3.2013: Bob says the Friday show included only the Dragon discussion plus talk about Curiosity’s computer problems. The Tito and cave exploration segment will probably be broadcast on Monday. The latest presentation to the Future In-Space Operations (FISO) study group is now posted in the FISO Working Group Presentations Archive. Both slides (pdf) and audio (mp3) are available for the talk, Orion/MoonRise: a Joint Human/Robotic Sample Return Mission from the Lunar South Pole-Aitken Basin by Leon Alkalai, NASA JPL, on Feb.27.13. See also the paper Orion/MoonRise: A Proposed Human & Robotic Sample Return Mission from the Lunar South Pole-Aitken Basin (pdf) by L. Alkalai et al. A report from JP Aerospace on the latest test of their MHD propulsion system, which would be used to power their airships to orbit (see writeup pdf): Magnetohydrodynamic Generator Test 90 – JP Aerospace Blog. Amy Shira Teitel writes about space history and in this essay she says, “Instead of wondering how NASA lost its edge, we ought to lay a foundation for a systematic exploration of space.” : We should drop the Apollo model in space, but keep the inspiration – Al Jazeera English. are being fitted with their own “goggles” — a computer and stereoscopic camera setup named the Visual Estimation and Relative Tracking for Inspection of Generic Objects, or VERTIGO — to demonstrate critical technologies for relative navigation based on a visual model. 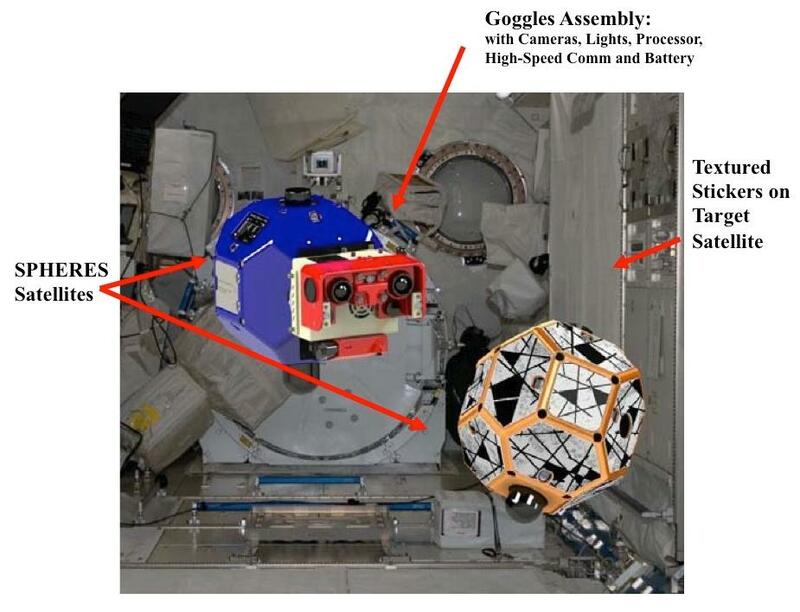 Brent Tweddle, a member of the MIT Space Systems Laboratory SPHERES-VERTIGO experiment team, recently spoke with ISS Update commentator Pat Ryan to discuss the technology behind these tests taking place aboard the station and its applicability for future spaceflight. The US House of Representatives votes to rename Dryden Flight Research Center at Edwards Air Force Base for Neil A. Armstrong and to rename the surrounding Western Aeronautical Test Range after Hugh L. Dryden. And some members of the House are seeking to change the way NASA is managed: New Version of Space Leadership Act Would Appoint NASA Administrator for Six, Not Ten, Years – SpacePolicyOnline. A campaign to get a US stamp recognizing the New Horizons missions to Pluto has taken a step forward: First Pluto-bound space probe gets review for US postage stamp – collectSPACE. (Alamogordo, New Mexico) – The New Mexico Museum of Space History, a division of the New Mexico Department of Cultural Affairs, is the first museum within the state system to become a Smithsonian Affiliate. An Apollo Boilerplate Command Module, the first artifact to arrive as part of the Smithsonian Affiliations Program, is scheduled to be delivered to the museum at noon on Friday, March 1, 2013 (weather and road conditions permitting). The official announcement will be made on the patio of the museum upon arrival of the boilerplate. “The arrival of the Apollo Boilerplate represents the first of many new artifacts and exhibits that the Museum will be able to share with its visitors because of our Smithsonian Affiliation,” stated Chris Orwoll, New Mexico Museum of Space History Executive Director. Affiliate organizations are selected for their record of presenting high quality exhibitions, scholarship, professionalism, and museum educational programs. The New Mexico Museum of Space History will be offering new museum membership packages beginning May 1, 2013, that will include Smithsonian benefits such as a one year subscription to either Smithsonian Magazine or Air & Space Magazine, personalized Smithsonian membership cards, and travel and tour opportunities. Of the thousands of museums across the country, there are currently only 177 Smithsonian Affiliates representing 41 states, Puerto Rico and Panama. The Department of Cultural Affairs is New Mexico’s cultural steward and is charged with preserving and showcasing the state’s cultural riches. With its eight museums, eight historic monuments, arts, archaeology, historic preservation and library programs, the New Mexico Department of Cultural Affairs is the largest state cultural agency in the nation. Together, the facilities, programs and services of the Department support a $3.3 billion cultural industry in New Mexico. 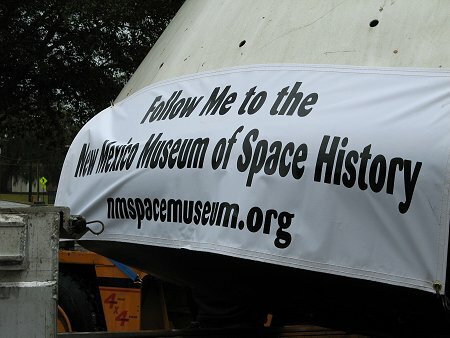 PHOTO CUTLINE: Apollo Boilerplate 1 – Behind this banner is an Apollo Boilerplate Command Module on its way to the New Mexico Museum of Space History from its previous home at the Discovery Center in Ocala, Florida. The boilerplate, which is the first of many exhibits and artifacts expected through the museum’s new affiliation with the Smithsonian, left Florida on Tuesday, February 26, and is expected to arrive at the museum in Alamogordo at noon on Friday, March 1, weather permitting. The public is invited to welcome the module to its new home. NASA ScienceCasts: What Exploded Over Russia? Comments Off on NASA ScienceCasts: What Exploded Over Russia?